This section of my site will expand over the coming weeks and months. I need someone to photograph me doing my routine, then I can share one pose at a time. But, don’t have that yet, so stay tuned. What I wanted to start with is a short explanation of why I do yoga and why it is so important to me. In the late 1990s I moved to Los Angeles. My exercise plan at the time was lifting weights. Living in LA my cardio workouts were limited because the city suffers from serious air pollution. Each year I dealt with either bronchitis or walking pneumonia, so running or cycling in the city were off limits. Every afternoon I would saddle up my motorcycle and ride to the gym. Weights, weights, weights. One day I was doing pull ups and felt something pop in my left forearm. For the next few weeks I was unable to lift, so I found myself spending more time on the stationary bike. In front of the bikes was a wall of glass, and on the other side was a yoga class. There were only eight students but the room was huge. Seven of the students were women. The one lone man in the class was so tight he could barely touch his knees when he bent over. I’m not flexible either so my first thought was “poor guy.” But he was doing it, and he was there every single day. “There must be a reason he is doing this,” I thought. So I got off the bike, walked into the studio and grabbed a mat. I didn’t know it at the time, but the instructor was a high-powered “visiting” yoga instructor who happened to teach this ONE class at the gym I was attending. Because the class was so small she could immediately assess where I was in the yoga skill department. And where I was? At the bottom. The very bottom. I wasn’t flexible, didn’t have good balance, didn’t have good form, couldn’t hold anything for any length of time, but I did have a basic level of strength. That’s it. Within minutes I was soaked in sweat, and I felt my body working in ways it simply never had. The instructor kept focusing on breath and mindset, and being a basic weightlifter I was thinking “What a crock.” I was sore for two days after the first class, but I went back and I kept going back. I became friends with the other guy in the class, and we would sneak looks at each other in solidarity. Looks that said “Just try to survive.” And survive we did. And progress we did. Within six weeks I knew I had found something special. The FIRST thing that surprised me was the strength I developed in my hands. I felt like I could crush glass bottles. I also realized that the yoga breathing the instructor was drilling into my head was also working, so I began to use it when I was in the car, on planes, at jobs, etc. Flexibility and balance were just byproducts of the yoga itself, not initial requirements. But most importantly, something began to happen to my brain. Brace yourself, this is going to sound woo woo. I started to see the world differently. I started to eat differently, and I felt a sense of peace I hadn’t felt before. Now, you could say I’m weak minded and easily led astray, and you might be right. But nobody was telling me this was going to happen, or telling me it was supposed to happen, it just happened on it’s own. Soon the idea of NOT doing yoga was foreign, inconceivable. And then I stopped. We moved back to Orange County, and my special arrangement with my gym in LA, which was I worked out for free, was no longer an option in Orange County. Yoga was EXPENSIVE. I was traveling a lot, working a lot and I just stopped going. Never once did it dawn on me to do it on my own. I felt I needed that instructor to push me. And then I got Lyme Disease. Cue screeching brake sounds. If you want to know more about my Lyme experience just check the “Lyme” tab on this site. I was suddenly reduced to very limited physical options. Yoga became, once again, my fallback. It has been roughly a year and a half since I started up again, this time doing yoga entirely on my own, at home, in hotels, etc. I travel with a mat and am doing my routine at least six days a week. For those of you who do yoga then you know. For those of you who don’t I wanted to share two books here. 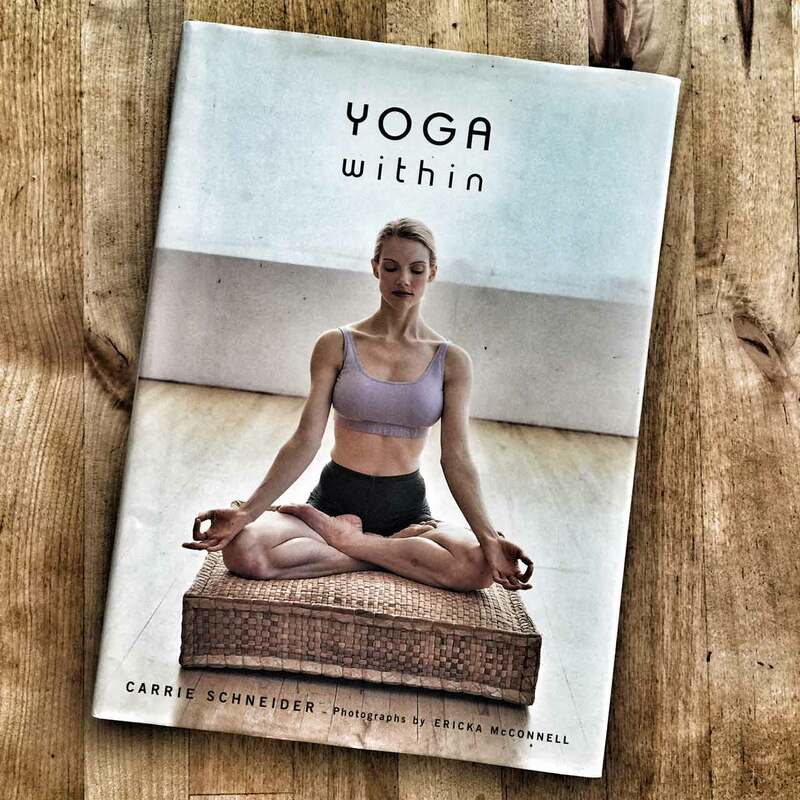 The first is “Yoga Within,” by Carrie Schneider. This is such a simple book, clean, easy and something I’ve had for fourteen years. This book provides a set of basic poses which is more than enough to get you started. The other book I’ve featured before. 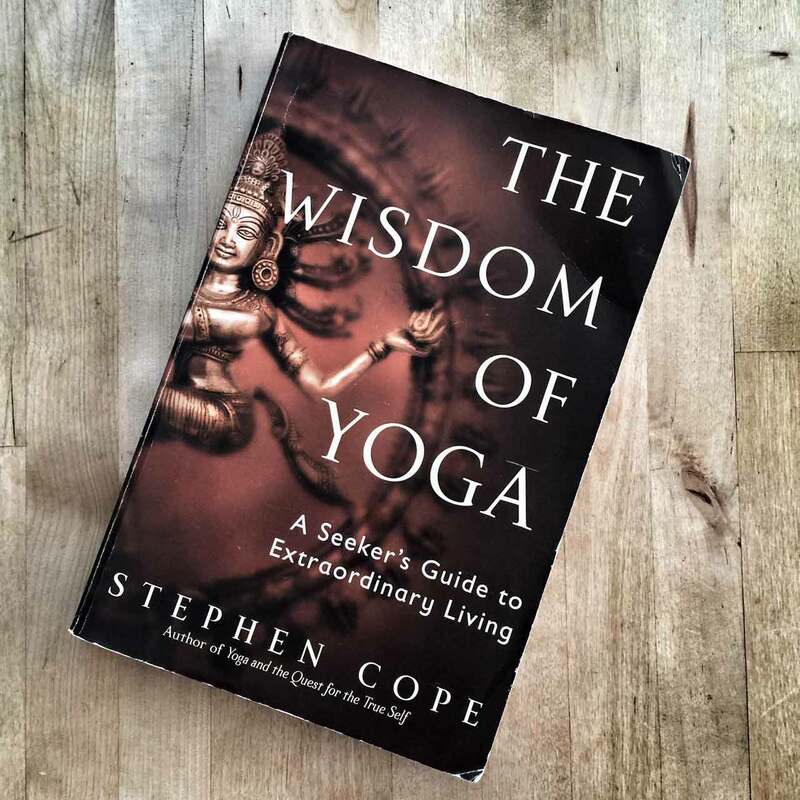 “The Wisdom of Yoga,” by Stephen Cope. This book will blow your mind about the cerebral side of yoga. Both fantastic, but both coming from different directions. My long term goal is to get my yoga teaching credential, but first things first. I’ll be filling out this tab more in the coming months. Being married to a devoted yoga person, let me add one minor piece of trivia. Yoga, even a little yoga (30 minutes, 4 times a week, say) makes you *insanely* *frickin* *hot*. I’m biased, but I think it’s objectively true. Women who do yoga has a certain way about them, and that way is pretty incredible. Just read this with interest. You and others recommended Yoga to me as a way to come back from an M.E relapse. First class put be right back where I started and so put me off. But as I make progress back again, I have found a 15 min intro class on Youtube with a lady called Lesley Fightmaster. Shorter lessons, paced for beginners, and I am no now half way through first 30 day program. Honestly feel it is helping even with the very basic amount I am doing and keen to carry on with this now as a part of a healthier lifestyle. Everyone will have their own yoga fingerprint. I saw a video recently of woman doing her fifteen minute routine that was so far beyond anything I will ever be able to do. But that’s okay. Just do what you can and focus. And just ordered Wisdom of Yoga – thanks for recommendation. GREAT book, you are gonna dig it. That would be great. I’ll figure it out…at some point. I’ve never been but will someday. I want to explore Oregon via van and bike. Oregon is king of gravel, so yes, that’s right up my alley. Looks so good I can’t stand it. That is uber cool. Man, I’m coming up this year. Bike, flyrod. Okay, that’s it. I want to be you. I’ve never tied a fly in my life. Always in a rush I am.